According to Google, today's doodle, featuring some of India's most iconic animals, was inspired by Indian truck art. 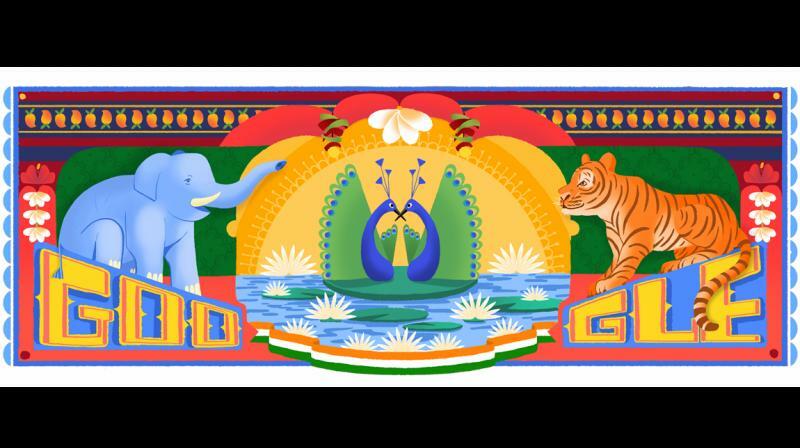 Google is celebrating India's 72nd Independence day with an extremely vibrant and folk artsy doodle which seems to be inspired from art that is generally notice across trucks in India. According to Google, today's doodle, featuring some of India's most iconic animals, Was inspired by Indian truck art, a long-standing tradition in this four million square kilometer nation where truckers who live on the road surround themselves with cheerful folk art to occupy their minds during long months away from their families." The national birds are placed in the centre with their beaks crossing each other and their feathers spread out. The national animal surrounds the two peacocks from the right side of the frame standing on top of the last three letters of Google while the elephant stands on the first three letters of Google on the left side of the doodle is a trumpeting stance. Other elements visible on the doodle include mangoes, the national fruit, which are placed on the top side like a border. The national flower, Lotus, is placed in the centre with the backdrop of the sun rising and the side borders of the frame are decorated with a riot of colourful flowers.